S-Jax – will he be be the man to finally get the Falcons back to the Super Bowl? It’s been a crazily busy week as 2013 Free Agency in the NFL has been in full effect. Starting with some big wide-receiver moves, including Wes Welker (going from catching bass from one Hall of Fame quarterback to another) and Mike Wallace moving to the Florida sunshine, its been tough keeping up with all the moves. One team that I think has been a big winner is the Atlanta Falcons. 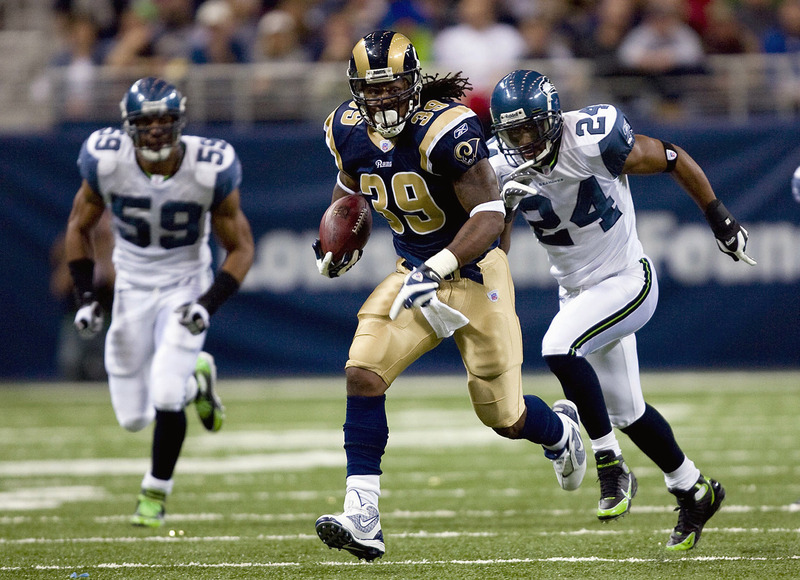 The NFC Championship losers just two months ago, they grabbed the best free-agent running back on the market in the form of veteran punisher Steven Jackson. Jackson has been a loyal servant to the St Louis Rams, whilst the talent around him has been pretty atrocious over the past decade. Jackson came into a Rams team that was fresh from two Super Bowl appearances, but has been about as competitive as Mother Teresa in the time he has been there. Like Barry Sanders, Jackson was the brightest shining star on a team of grubby meteors (always descending), so to be picked up by a team that was less than a touchdown from the Super Bowl will be one almighty relief for him. S-Jax will be a significant upgrade on the chunky thighed plodder Michael Turner, and he will provide a formidable backfield partner to third-year back Jacquizz Rodgers. Rodgers has not had the chance to prove himself as a three-down back, and wont get the chance now Jackson is signed, but he is a great receiver in the backfield with 74 catches in his first two seasons in the NFL. In addition the Falcons persuaded future Hall of Fame enshrinee Tony Gonzales to come back for one more season. There are some excellent tight-ends available in the 2013 NFL Draft, and the Falcons may pick one up as the heir-apparent in Round Two or beyond, but to have Gonzo back, with his 70-90 catches is going to have Matt Ryan smiling. Atlanta have also re-signed safety William Moore and offensive linemen Garrett Reynolds and Sam Baker. No superstar names here, but keeping your own garden tidy is always important if you want to grow sweet smelling roses. With the free-agency market showing few signs of slowing down we can expect more movement this weekend, and I will be spending time reviewing every move. Lorenzo Alexander (LB) Washington to Arizona – Alexander is not a household name, nor a starter even, but he went to the 2013 Pro Bowl as a demon special teams tackler. The Redskins could not afford him because of salary cap penalties, but they will miss him for sure. In Arizona he will get the chance to start at outside linebacker, but I doubt he will become a Pro Bowler again in the desert. James Casey (TE/FB/HB) Houston to Philadelphia – Casey moves from a Texans team where he should have featured as a 50-60 catch tight-end, but instead was used as a fullback. In Philly he should be moved all over the field and could have a huge 2013 being the safety blanket for Michael Vick in new head coach Chip Kelly’s explosive offensive scheme. More free-agency commentary to come, after I get a decent coffee.